This one was told by Hugh Fullerton in The Chicago Tribune, and is about the contract Waddell signed to join the Chicago Orphans in 1901. Despite the erroneous story, told through the decades, that the Pirates were so anxious to rid themselves of Waddell that they let him go for a cigar (or a box of cigars in some versions), there was actually a great deal of interest in Waddell and while the sale price was never disclosed, The Chicago Daily News said Chicago paid “good money” for the pitcher. In addition to Chicago, other contemporaneous reports said the Boston Beaneaters were very interested in obtaining Waddell. “(Rube) was threatening to annihilate several members of the team and he was on one of his periodical rampages. Boston wanted him badly—and so did Chicago. Boston offered to give him $3,500 for the remainder of the season, and Chicago was willing to pay him only $2,400 and Loftus was delegated to sign Rube and make him be glad to knock off $1,000 from his earnings from the end of May to the middle of October. Loftus cornered George Edward and commenced jollying him. “’I’ll tell you, Tom,’ said Eddie, ‘I’d rather play with you than with Boston, but they offer me $1,100 more. “’I’ll tell you, Eddie, what I’ll do. You sign that contract, and when we get to New York I’ll buy you the best Panama hat in town. Waddell’s time in Chicago was brief, and typically bizarre. After posting a 14-14 record and a 2.81 ERA for Loftus and the Orphans, Rube received an offer he couldn’t refuse in September. 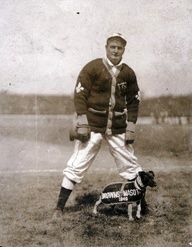 The Tribune told the “pitiable little story, this tale of ‘Rube’ Waddell and his love of nature.” Waddell had deserted the team to play for an amateur club in the town of Grayslake, Illinois, about 40 miles north of Chicago. The Tribune said Waddell was induced to go north with the promise of being able to fish six days a week, if he pitched on the seventh. The Orphans suspended Waddell for the remainder of the season. In December he jumped Chicago to join Los Angeles in the California League.